FAQ: We're in a rush. 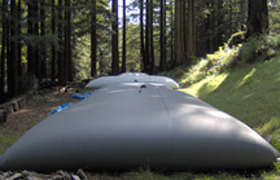 Can you ship flexible water tanks ASAP? Most flexible tanks are custom built to the required specifications by our customer. We can sometimes send tanks rapidly, when we have them in stock. In order to accomodate special liquids, like fuel or hydraulic fracturing fluids, there will be a lead time associated with tank production. Question: We are urgently looking for our clients for flexible water tanks with the capacity of 50,000 Gallons. It can be divided if necessary. Answer: Hello! Thanks for contacting The Portable Tanks, a division of GEI Works. We are happy to help, especially knowing that this is a time sensitive situation. Our Flexible Water Tanks are one of our most versatile products and they can be built in almost any size up 250,000 gallons. This includes a tank with a capacity of 50,000 gallons. We do sometimes have flexible tanks in stock, and can ship those quickly. If not, as you're buying directly from the manufacturer, we can mobilize quickly to meet your project's needs. Fittings: Most tanks will come standard with a ball valve fitting anywhere from 3/4" to 2". Adapters can be added to fit hoses and other filling devices. If larger fittings or additional fitting types are required, please let us know. Read for more information about Pillow Tanks.We look forward to hearing back from you and working on this project. Questions? We can help! Call us: +1-772-646-0597 or request a quote to discuss your project.